The New Bright Pro Dirt Ultra Lite series of RC cars & trucks are available as a racing buggy, a monster truck, or this "short course truck" style that I tested here. All of them have the same chassis and will perform essentially the same. This is a very small vehicle, listed at 1/36th scale, and it has a very thin, yet sufficiently durable removable body that helps it live up to its "ultra light" title. It has working independent suspension at the front, and a suspended live axle at the rear, and the springs are soft like they need to be. Some manufacturers are actually starting to catch on about spring tension these days and using springs that aren't so stiff that they're useless! Good! 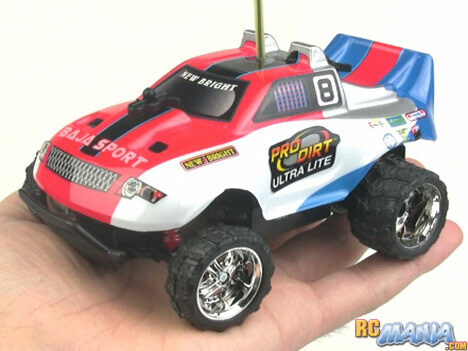 The New Bright Pro Dirt Ultra Lite vehicle takes 3 AAA batteries, and the controller takes two AA's. These are not included. The controller is nice and small to better suit small hands, but it's versatile enough to still be usable by adults. Speaking of the controller, it has New Bright's 4-band system built in, so by flipping a switch on the controller and another on the vehicle, you can change radio frequencies and race up to 4 of the same vehicle together. The previous vehicle I tested from this company was the terrible New Bright Interceptor buggy. In that review, I noted that the Interceptor used a tiny motor that should have been put in a much, much smaller vehicle. Well, the Pro Dirt Ultra Lite truck is a much, much smaller vehicle, and guess what? It uses a motor that's about the same size! The New Bright Pro Dirt Ultra Lite short course truck is a real joy to drive from the moment you squeeze the trigger. I actually didn't even start on a smooth surface -- I went straight for dirt & gravel. It didn't bog down at all, indicating that it has plenty of power and good gearing. The ride was a little bouncy, but in fairness, the surface was pretty rough for the size of the truck. The suspension did do its job as best it could. Steering response is excellent. There is no digital proportional control, but it felt natural and I never found myself wishing for more. This truck will drive equally well on floors, concrete, dirt, light gravel, or low-pile carpeting. It can even drive on medium-height carpet without slowing down too much. The New Bright Pro Dirt Ultra Lite series of 1/36 scale RC cars & trucks are really great for younger kids, especially for the price. They're truly fun to drive, plenty fast, and terrain-capable. The 4-band system ensures that the parent buying the vehicle never needs to worry about a radio conflict with a sibling's RC. Good job New Bright.